November is the month to think about adoption. About so many kids in our world just needing a family to love them unconditionally. 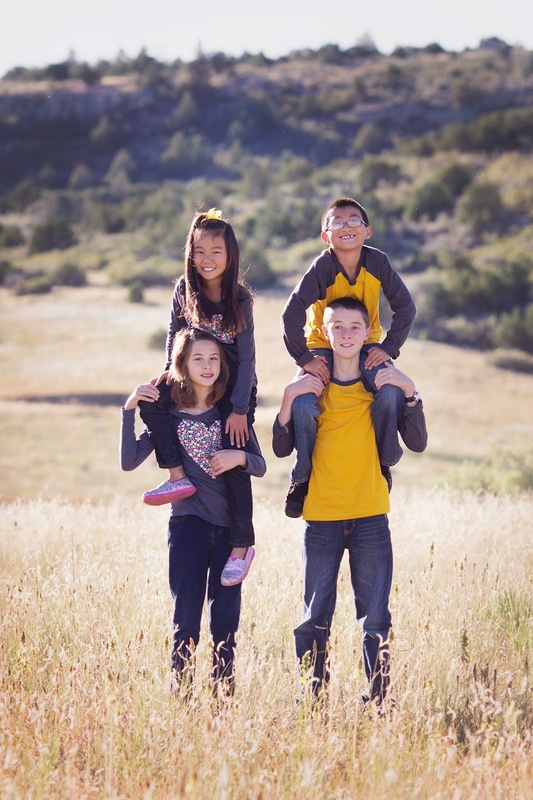 Our family has been blessed by adoption in so many ways. Here is our story that was written for our adoption agency of AAC for their blog. Adoption for us would start with a television show on girls in China. A phone call to a very close friend would confirm that this would be a great adventure for my husband and I to take. My heart and my mind were on a journey, one that would bring a daughter home to us after having two biological children. The country was China, but plans change and Korea was the country chosen. We waited as patiently as we could, and the day would come that we would see her little face on our computer as quickly as the dial up internet would allow. I remember the tears and the excitement we had that day. She would come home in a very short while and was one of the three most beautiful babies my eyes had ever seen. As life has it the journey would not be complete. It wasn't long before my heart once again felt that tugging feeling. My heart may, at the time, have been the only one feeling that but being married to a good man left me with hope that he would change his mind. He put some rules down on this next adoption thinking it would take me awhile to find another baby that would fit his ideas, but it was only a matter of days until I saw my little boy in China. I knew in an instant that he would be ours and when my husband came home it only took him a moment to also realize this angel would be our son. I didn't get to travel to China as our house was now full of little ones. This always broke my heart, but I knew my husband and parents would bring our little boy home to me. Fast forward some years and life is full of adventures with our four children. Adoption has not always been an easy path, it is hard to grasp just how much our little ones have lost and how that affects daily life and family. For this reason I have learned the true meaning of unconditional love and marveled time after time at how my heart can love so fully and completely beyond biology. I would never trade being their mom for all that I know and feel. Adoption has changed me for the better and become and huge part of who I am. As life would have it once again there would be a little nudge in my heart. I knew this time the wanting another child might not work as this would be a child number five. I knew I had to be patient and wait until my husband either said yes or no. I knew he truly had to be ok to add another child and had to make up his own mind. Three weeks later he said the answer was yes. Yes, to making our family big by today's standards, loud in so many ways, and full of love. So we are waiting again for me to be called Mom by one more little one. He will be our baby and waiting for him is so very hard. Praying and trusting that they day will come that I can travel to Korea and hold him in my arms. Arms that will have to share because not only has my heart been tugged by adoption but each child we have has been changed by adoption. So the journey continues as we move from a family of six to seven! Praying for you friend and beautifully written as we wait together!